When thinking of curd most people automatically think of lemon curd. But there are so many more fruits to turn into this delicious creamy dish! And it is so easy, too. You might have some left over eggs in the fridge, then all you need is any kind of citrus or other kind of fruit, and you’re good to go. This curd tastes great as a spread on any bread or cake, as a macaron filling, with yoghurt or on scones… anything you want. 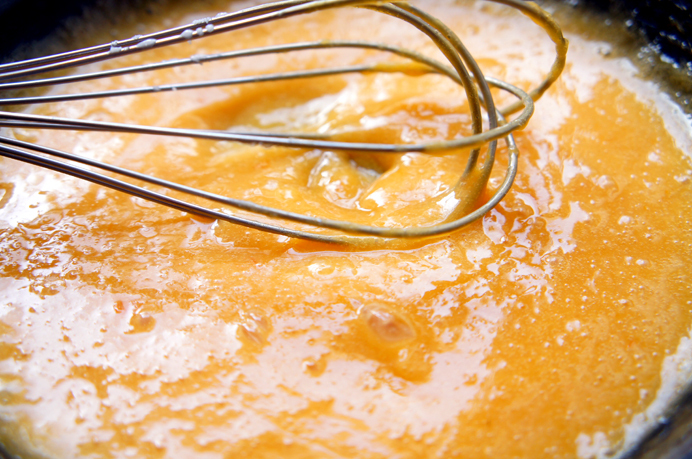 Whisk together the grapefruit juice, zest, sugar and egg yolks to a smooth mixture. Pour the mixture into a heavy saucepan pan and heat over medium heat while stirring constantly. Continue stirring while keeping the heat on a medium level. The mixture will slowly firm up. Don't bring it to a boil cause the eggs will get flaky and the curd is ruined. Once the curd is creamy, add the butter spoon by spoon. To give it an extra of freshness and juicy flavour, add about 1-2 tablespoons of left-over grapefruit juice and some more grated zest at the very end. You can also add a little dash of beet root powder to give it a more orange or even pink color. Fill the curd in a resealable glass before it's cooled down. Where do you use this curd?